Captain Valerii puts her plan into motion. Captain Valerii uses her connection with the centurions to change their programming, "awakening" them to a new awareness of themselves and the universe. She tells Commander Adama she's taking the centurions home to the heart of the Cylon civilization. While this is happening, the Earth Protectorate launches an attack on the Galactica, seeking to kill the Returners, who they think may be able to lead the fleet, and thus the Cylons, to Earth. Adama convinces Captain Valerii's centurions and the Returners to help stop the Earth Protectorate attack, which they successfully do. After a heartfelt farewell to Helo, Captain Valerii, the centurions, and the Returners are allowed to leave the fleet in the pirate shuttle ship and make an FTL jump to a huge Cylon base on the other side of the galaxy. The issues of this series were untitled. I assigned the title "Conscience" based on the burgeoning awareness of the centurions and Returners in this issue. As Captain Valerii and the Cylon Centurions (sounds like a rock band!) say goodbye to Commander Adama to head home to Cylon space, notice that the antebellum centurions all salute him, while the modern ones do not. Page 10 implies that the mother of Anastasia and Darrin Dualla was very religious and implored her children to embrace the words of the Sacred Scrolls. 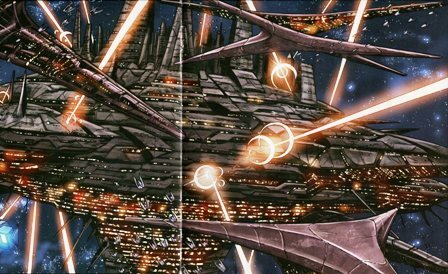 On page 21, Captain Valerii and the Returners make an FTL jump to a Cylon base that looks similar to a super-basestar, as seen in the BSG70 stories "The Law of Volahd" Part 2 and "The Death of Apollo" Part 2. A similar one was also glimpsed in the BSG2000 universe in "God in the Machines" Part 4. The one seen in this issue is later referred to as the First Cylon Imperial City in "To Be Human".